There is no evidence supporting any current theory on how Stonehenge came about, or why. So the key is to have an open mind, and not to be limited by what we were taught... when was the last time you walked off the edge of the planet.? What you see collected on this site, are the works of Bruce. He is a life-long member of MENSA, a puzzle expert and inventor of the Bedlam Cube™. Bruce took it upon himself more than 30 years ago to unravel one of the Worlds most famous puzzles... Stonehenge. "I am not an archaeologist, but I have a unique ability to puzzle and work things out. I am a systematic, logical person with many years of experience in searching for the unknown. I decided to take on Stonehenge as a challenge and a personal quest in the form of a puzzle. I knew it would take years and there was also the possibility that my quest would never end. Years of research and study have enabled me to see the questions that needed to be answered before any sort of theory or reconstruction could take place." " What I did was look at Stonehenge and start to ask these questions. Why are the stones so big? Why are they in a circle? Why are they joined together? What was the purpose of Stonehenge?" Bruce’s theories are logical, practical and will change your views on our history, as you think you know it. Bruce believes he has made one of the greatest archaeological discoveries ever. He has found not just a new interpretation of the building and its origin but also how the stones were transported, the route taken, how they were raised, what Stonehenge was used for, and most importantly, who built it. He believes he has a story here that will astound the world. The mystery of Stonehenge may have baffled experts for centuries, but British Inventor Bruce is sure he will win people round to his way of thinking. 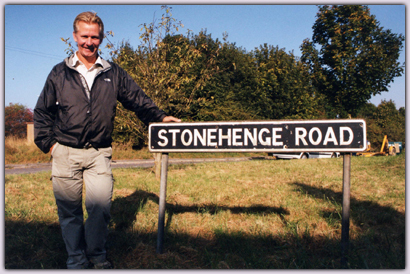 It has taken Bruce 30 years of research to come to a theory that Stonehenge was a building. "What I did was look at it and start to ask some questions. Why are the stones so big? Why are they in a circle? Why are they joined together? I had to come up with an answer that would cover all the questions." Copyright © 2008 Bruce. Email Bruce at Stonehenge Ltd. All rights reserved.